With a gorgeous tropical climate, a wealth of Mayan marvels, and 14 miles of white sandy beaches, it's no wonder that Cancun is Mexico's premiere tourist destination. The high season is between December and April, when the temperatures are manageable and when the risk of hurricanes and tropical storms are at their lowest (both excessive heat and hurricanes can be a problem from June to September). 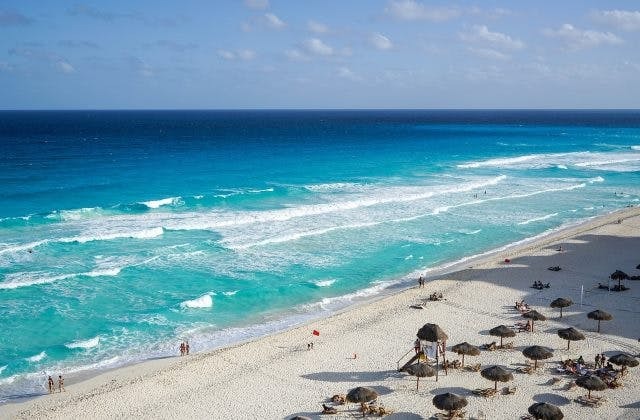 One of the key attractions of Cancun is its beaches, and they are a true delight. Complete with powdery sand and turquoise waters, the Isla Mujeres (Women's Island) is just off the coast and offers a more unspoiled atmosphere away from the resorts. While most tourists who come to Cancun stay at all inclusive hotels, in order to see the city and experience the local culture it's advisable to get off the sun lounger (temporarily at least) and get up to explore- there's so much to see. There are plenty of guided tours available to Mayan sites such as Chichen Itza, although many of the pre-Columbian cities and relics lie deep in the Mexican jungle. To learn a little of Mexico's fascinating pre-European past, the city's Museo Mayo de Cancun offers a great starting point. Fully air-conditioned, it was six years in the making and finally opened its doors in 2012. For a flavour of the city as the Mexicans know it, head to one of the city's many markets and be prepared to haggle for a bargain. Spanish language skills may help you here, but with hundreds of trinkets and treats on offer from jewellery and blankets to sarongs and sea shells, the temptation to purchase is strong. Market 28 is the best place for souvenirs and is very affordable, but haggling and bargaining is definitely part of the process. The city is also proud of its Little Mexican Cooking School, where visitors can come along to learn how to prepare authentic national and regional Mexican dishes before taking their creations (and their newfound culinary skills) away with them. For those who prefer outdoor adventures and water sports, Cancun has much to offer in the way of excellent scuba diving, fishing, cruising, zip lining, snorkelling, yachting, and even swimming with sharks. Additionally, spa facilities abound in Cancun, with over 30 specialist spas offering every conceivable treatment and pampering session, many with beautiful views over the turquoise ocean. One final tip: drink bottled water outside of the resorts. Virgin Australia has the slowest flight between Sunshine Coast and Cancun at 65 hours and 37 minutes. Cancun has the International Air Transport Association (IATA) airport code of CUN. The UTC/GMT value for Cancun is -21600.